Relaxing in peaceful rural surroundings in sought after Hamurana, this stylishly refreshed 300sqm lifestyle residence is positioned for optimum visual gain. The lake views are stunning. Fully redecorated in a colour palette of whites, tea, and greys, the home combines a lovely country vibe with a semi contemporary feel. There are 2 living areas for relaxing and enjoying the picturesque outlook. A curved island bench in the modern light-filled kitchen maximises connectivity while ample glazing invites the views indoors. Designed for family living, interiors encompass four generous-sized bedrooms including a generous master with a large ensuite. The guest room also has an ensuite. Bathrooms are pristine tiled spaces. A carpeted four-car internal access garage, along with on-site parking, take care of vehicles. The well-fenced property is ideal for children and pets. A small portion is suited to grazing. 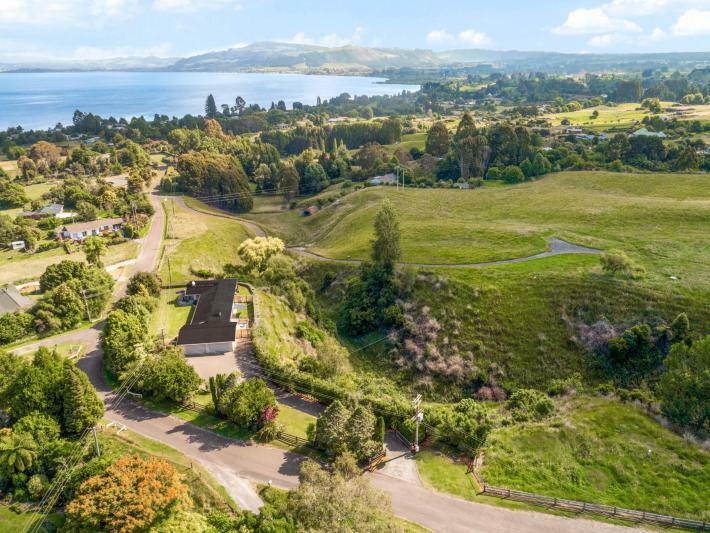 Tucked away in a private setting at the end of a quiet cul-de-sac, the 1.74ha property is a 5 minute walk to the new lake-front boardwalk and swimming beach. A community dairy lies at the end of the road. Hamurana is renowned for its beautiful, crystal-clear freshwater springs. It is also a popular fishing spot. Ngongotaha is 6-7 minutes away, and Rotorua central is a further 10 minutes on. Pyes Pa is a 40-minute commute. Roof has been photoshopped and will be painted in January 2019.